Murder by Gaslight: The Cannibal of Austerlitz. Simon Vandercook was a 55-year-old “eccentric wanderer” from Lansingburgh, New York, a fortune seeker who relatives said was always filled with “utopian schemes.” In 1882, he claimed he had discovered gold outside of Alford, in Berkshire County, Massachusetts. Berkshire County had several small iron mines, with Marble and other minerals found there as well so a gold discovery was not considered impossible. Vandercook purchased the land for his gold strike from Oscar Beckwith in exchange for shares in the company he formed to mine the gold. If Vandercook had actually discovered gold, the mine was not producing enough to sustain fulltime operation, and he earned money by cutting trees on the property and selling lumber. Beckwith believed he had been swindled and threatened to sue Vandercook. Oscar Beckwith was a 72-year-old hermit who lived in the woods, just across the border in Austerlitz, New York. He had a small, squalid shack with no furnishings but a stove, a bunk, and two stools, situated in an isolated spot under a ledge of rock. In spite of his age, Beckwith was strong and powerful; described as a desperate man who had served time for stealing horses. “Nothing but some pork rinds,” Beckwith responded. He said Vandercook had left with a man from Green River, New York and would not be back until March. Caulkins remained suspicious and returned the next day to find that Beckwith had fled and inside the shack were the mutilated remains of Simon Vandercook. The back was split down between the ribs, and the other portions were sawed and cut up. The bowels and intestines were in a basket, strips of flesh were on the bed, and an arm and leg lay on the floor alongside a blood-stained axe. In the stove were the charred bones of his head, feet, and arms. The coroner ruled that Beckwith had murdered Vandercook, but there were no funds available to pursue the killer. The town of Alford offered a $500 reward for his capture, the governor of New York also offered $500 and the sheriff of Columbia County offered $250. The rewards generated several arrests on suspicion, but Beckwith had already fled to Canada. With no news on Beckwith’s whereabouts, the newspapers began publishing local rumors. It was alleged that Vandercook’s liver was found in Beckwith’s frying pan, and part of it was missing. It appeared to some that Beckwith had washed Vandercook's flesh and was preparing to salt it down to sustain him during the winter. It was not hard to believe that Beckwith was a cannibal, he was known to have indiscriminate eating habits. A stage driver who knew him said Beckwith had eaten a horse that died of disease. 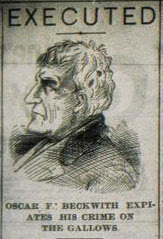 Beckwith remained at large until 1885. Detective J.B. Gildersleeve of Columbia County tracked him throughout Canada and finally captured him in Bracebridge, Ontario. He brought Beckwith back to New York to stand trial. Oscar Beckwith was tried in Hudson, New York and convicted of the first-degree murder of Simon Vandercook. However, a succession of appeals, retrials, and “lunacy hearings” led to five more trials before Beckwith was ultimately convicted and sentenced to hang in 1888. Through six trials, Beckwith’s alleged cannibalism was never mentioned. Beckwith was hanged in Hudson, New York, on March 1, 1888. It would be New York’s last execution by hanging and, at 78, Beckwith would be the oldest man to hang in New York State. A “modern” gallows was shipped to Hudson in pieces from New York City. It was guaranteed to break the condemned man’s neck quickly and cleanly, but they hadn’t factored in the old man’s toughness—Beckwith swung for 18 minutes before dying. 1888: The Last Hanging in New York State Cornell University Law School. “The Alford Tragedy Hudson, New York,” New York Herald, January 15, 1882. “An American Cannibal,” Jackson Citizen, February 7, 1882. “Another Hill-Town Tragedy,” Springfield Republican, January 13, 1882. “The Austerlitz Horror,” Boston Herald, January 14, 1882. “Berkshire County,” Springfield Republican, January 17, 1882. “The Cannibal Caught,” Wheeling Register, February 13, 1882. “Crazed by a Murder,” Jersey Journal, January 27, 1882. 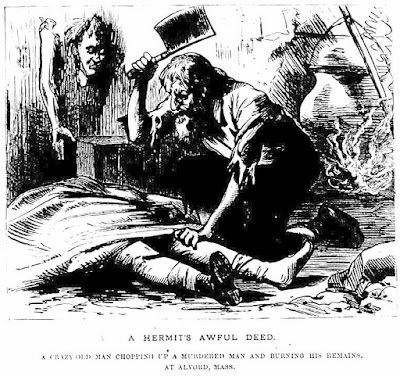 “A Hermit Savaged,” Jersey Journal, January 13, 1882. “Local Intelligence Local Notices,” Springfield Republican, February 8, 1882. “Local Matters,” Times, January 19, 1882. “The Man-Eater Captured,” Chicago Daily News, February 7, 1882. “On the Gallows,” The Boston Globe, March 1, 1888. “Roasting a Corpse,” The National Police Gazette, January 28, 1882. Hi Robert, I would love to interview you on my show about your blog. Do you have a contact E-mail address?